Many pets are sitting in a room quietly, waiting apparently. Suddenly, the door flies open and a green Shoyru, carrying a rock and a paperbag, ran inside. "*breathing* S...sorry I'm l...late!" After a moment of catching his breath, he walked up to a projector and put the bag down. "Thank you for coming everyone, my name is SkitSkitneo! This! 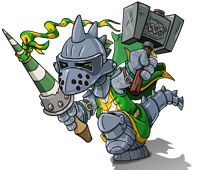 ", *holds up rock*,"is my petpet, Stonez!" Several pets clap, some coughed, others did nothing. "Yes, well I have made a special slideshow dedicated especially to Stonez! So let us begin!" SkitSkitneo reaches into the bag and pulls out some slides. "This, is the slide that shows how I found Stonez!" In the slide, SkitSkitneo is seen tripping over a a rock as a Barbat flies just inches above his head. "He saved me from a very painful headache that day!" Laughing is heard from the audience. "Stonez, was also the one who taught me how to fly as this slide shows." Stonez appears to be rolling down a hill as SkitSkitneo is flying overhead. "Stonez even helped me be more braver!" A pant devil is seen 10 feet away from SkitSkitneo who seems to be desparetly trying to runaway, but Stonez is sitting on his tail. "It was also Stonez who taught me how to accept pain and not lose strength!" SkitSkitneo is seen with a large lump on his head, while Stonez is falling to the ground. "Now," SkitSkitneo said slowly," here is a slide of Stonez fighting...DR. SLOTH!!! *Bum bum bum bumm is heard from out of nowhere* "Where did that wierd sound come from? OH! The slide!" The slide shows SkitSkitneo carrying a piece of omlette, with Stonez on his shoulder, when out of the shadows, Sloth appeared. "Sloth attacked me in a moment and threw Stonez aside." The slide shows SkitSkitneo held in the air by Sloth while Stonez is on the ground. "Then, Stonez hurled himself at the Doc, hitting him in the hand, releasing me, then attacked Sloth head on!" SkitSkitneo is lying on the ground as Stonez is seen smack in the middle of Sloth's face. "I was lucky that Stonez was there." In another slide Sloth is seen running away with many bruises. "That was my slideshow made for Stonez, any questions?" SkitSkitneo points to a Chia in front. "How did you manage to get all of those slides?" "Simple...uh...I have no idea." "Spooky" "Yes, very spooky, anyone else?" Points to a Grarrl. " Ugga ug rarg." "What?" "Ugga ug rarg." "I'm sorry I don't speak Tyrannian." Suddenly, Stonez jumped on SkitSkitneo's nose and said, "He said 'Nice pet rock!'" "Oh, thanks...YOU CAN TALK!!"